Translated literally, "bibimbap" means "mix-mix rice." This widely popular Korean dish is something of a paradox, as the meat and vegetables are cooked separately to maintain their color, flavor, and texture, but the diner ultimately mixes it all together in an oversize bowl. Read carefully through the recipe before beginning. Don’t be put off by the number of steps; each one is easy. I recommend preparing the vegetables and meat in advance, as bibimbap ingredients are not served hot but at warm room temperature. This leaves just the rice to steam before serving. Make the marinade: Combine all of the marinade ingredients in a bowl. Stir to dissolve the sugar. Prep the meat and mushrooms: Trim fat from the beef and slice the meat across the grain into very thin slices. Stack the slices, cut them into thin strips, and set aside in a bowl. If using fresh mushrooms, remove the stems (save the stems to use in stock) and slice the caps. Put the sliced caps into a separate bowl. Pour half the marinade over the beef and half over the mushrooms. Stir to coat. Prep the carrots: Peel the carrots and cut them into julienne pieces about 3 inches long, or use a mandoline. Heat 1 tablespoon vegetable oil in a large skillet or wok over medium-high heat and stir-fry the carrots until they are crisp-tender. Set the carrots aside. Prep the spinach: Blanch the spinach for 15 seconds in a saucepan of boiling salted water. Lift out the spinach (reserving the water for cooking the bean sprouts) and plunge it into cold water to cool. Drain and squeeze out excess water. In the same skillet used for the carrots, sauté the spinach in 1 tablespoon vegetable oil, season with salt and pepper, and set aside. Prep the bean sprouts: Add the bean sprouts to the spinach-cooking water and boil for 2 to 3 minutes. Drain well and let cool. Make the rice: Steam the rice with slightly less water than the package directions suggest — for example, if the ratio is 1 cup rice to 2 cups water, use 1½ to 1¾ cups water instead. This will result in a firmer, chewier grain. Make the beef: Heat a large skillet over medium-high heat. Add 1 Tbsp. vegetable oil. Carefully lift the beef slices out of the bowl of marinade and place in the frying pan, leaving behind any remaining marinade and meat juices. (Reserve the marinade.) Spread out the meat into a single layer in the skillet. Cook and stir for 1 to 2 minutes, or until beef is cooked to medium. (It may be necessary to do this in two batches.) Remove beef to a new bowl. Make the mushrooms: Using the same skillet, sauté the mushrooms in 1 Tbsp. vegetable oil over medium heat until they absorb any excess liquid and begin to brown. Remove to a new bowl. Pour any reserved beef marinade back in the skillet and let bubble for 1 minute. Pour the cooked marinade back over the beef and mushrooms. Make the eggs: If using eggs, fry them in vegetable oil sunny-side up, until the whites are set but the yolks are still runny. Assemble the bibimbap: When the rice is done, scoop rice into individual bowls and top with slices of beef, mushrooms, carrots, spinach, and sprouts, finishing by ladling some of the remaining cooked marinade over each bowl and topping with an egg (if using). Pass little bowls of the gochu-chang, kimchi, sesame oil, sesame seeds, and seaweed at the table. Alternately, scoop rice into individual bowls and let guests select their own choice of protein and vegetables before passing the bowls of panchan around. To make it easy to cut very thin slices of beef, put the meat in the freezer for about 30 minutes or until it is partly frozen. To rehydrate sliced shiitakes, soak in warm water for 20 minutes or until softened. Drain, reserving the soaking liquid for soups or other cooking. Look for gochu-chang that is free of MSG, additives, and artificial coloring. Vietnamese chile sauce sweetened with sugar or honey may be substituted if you cannot find gochu-chang. Try toraji namul (seasoned bellflower root) and kosari namul (seasoned bracken fern). These two mountain vegetables have traditionally been considered essential to bibimbap. 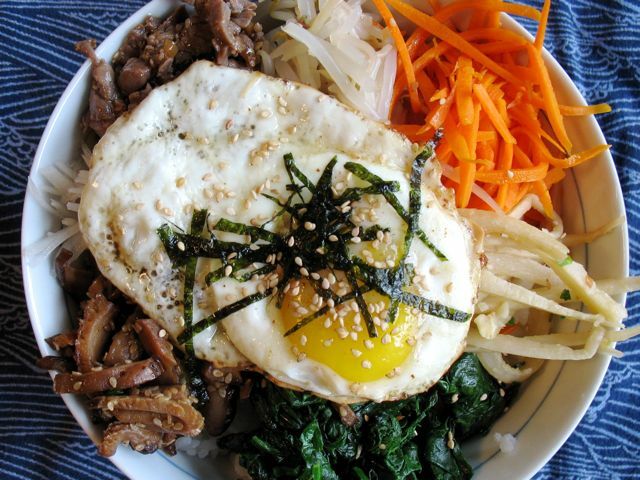 Read more about making bibimbap in Kelly Myers' "Bowled over."